Love brunch AND chocolate? Then Jaz & Juls Chocolate House will be the ideal destination for you. Located just a few minutes walk from Angel tube station, at the far end of Chapel Market, Jaz & Jul’s new weekend brunch menu features an array of tempting delights that are perfect to indulge on during the weekend. Start off with one (or two!) 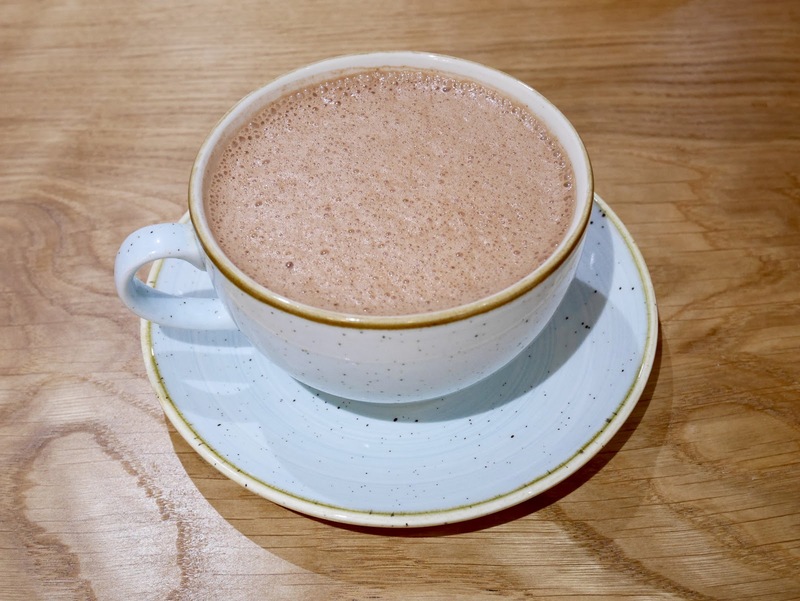 of their award-winning hot chocolates that are made with real chocolate shavings, using single-origin chocolate sourced from small producers. These are available as pure chocolate or in a range of natural flavours. You can even go full out with toppings of artisan marshmallows and whipped cream, and even add a shot of liqueur to make it boozy. If you prefer something cold to cool down in the summer months, they have some thirst-quenching chilled drinks on offer. There are both sweet and savoury waffles to satisfy both parties. I tried my first cornbread waffle which was topped with Mexican-inspired black bean chocolate chilli and avocado, and the farinata which are chickpea pancakes. My sweet-tooth cravings were then satisfied by the sweet waffles: plain waffles with baked cinnamon-apple slices with Kentish cobnut ice cream, followed by the decadent chocolate-stout waffles with banana, chocolate sauce and crushed peanuts. For those looking for some lighter options, they do a couple of granola-topped smoothie bowls which includes the Chocolate Avocado, and Berry & Almond – both just as tasty and filling. Some of you may be glad to know that almost all of Jaz & Jul’s new all-day breakfast dishes are also vegan – so there’s something for everyone to enjoy. A selection of special brunch cocktails will also be available at the Chocolate House during the day on Saturdays and Sundays to accompany the new menu, as well as the renowned independent producer’s full collection of handmade single-origin drinking chocolates served hot or iced with whipped coconut cream. And ONE last thing not to miss out on – gourmet ice lollies and choc ices – I missed trying one of these that day, but it sure looks and sounds good!